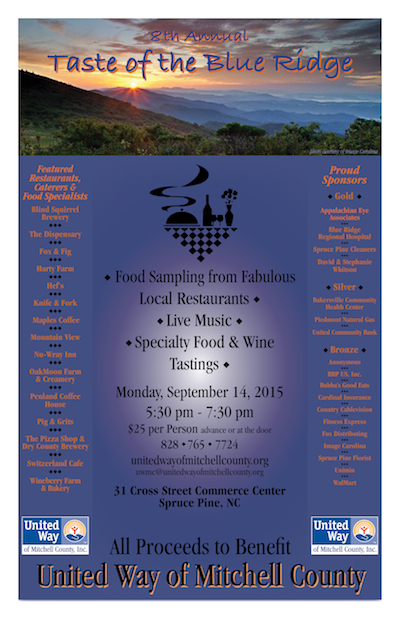 Don't miss the 8th Annual Taste of the Blue Ridge, sponsored by the United Way of Mitchell County, on Monday, September 14 at the Cross Street Center in Spruce Pine! Guests can sample food, wine, beer and other delicacies made by local restaurant owners, caterers, farmer’s market vendors and more. Tickets are $25 per person, and are available in advance or at the door. Visit our Taste of the Blue Ridge Facebook event page or call 828-765-7724 for more information.